Great quality for the price I paid, would have got 5 stars, but a little uncomfortably for walking but that's probably due to the need to be rigid. most comfortable pair of boots I own. perfect for bike. waterproof and warm. flexible yet stiff at ankle. aged look yet hi tech. lacing system is slick and easy on easy off. no tight spots or irritating chafing all in all every good bike boot with reinforced top cover for gear changing. may not be alpinestars protection but then again what will really protect you? Comfortable, casual shoes with added protection. Been using them for few weeks now, very comfortable to ride or walk but hard sole makes them bit too stiff to use as driving shoes. Definitely warmer than most of regular shoes, feels OK in the 2°-20°C range, looking forward to test them during summer. Materials used seems to be high quality, was hoping for more protection in toes and ankle area, but still it's a great product in a great price. Liked the boots, look good, nice finish but the insole dug into my instep so bought replacement insoles and all is good. A great casual urban shoe, size 8 sizing bang on for me. A great shoe for hopping on and off the bike around town. Not much in the way of protection, but probably better than a pair of hiking boots, so down a star for that. A bargain at the sale price, wouldn't have bought at full price. Great boots - stylish and easy to walk around in but most importantly they are warm, waterproof and feel secure on the bike. A great buy at a great price - SportsBikeShop rocks!! These boots are a perfect fit, so comfortable and the quality seems really good. Got for short rides and summer outings, these look good with my motorcycle trousers and also with jeans. Good feel when changing gears. Very comfy - would happily wear them all day. Boots feel very sturdy and have plenty of protection including the ankles. Plus, the casual look goes really well with a pair of Kevlar jeans. Not yet tested in the rain, so can't comment on how they hold up in the wet. Lightweight boot that's probably good for shorter rides in fair weather due to their short length. Comfortable fit. Ideal as a second pair for summer riding. Probably not ideally suited to longer rides due to the limited toe protection. Protective without being overly firm. Stylish and comfortable. Perfect fit and sizing is true. I'm a size 9 in most brands, and the size 9s in these were perfect. Haven't tested the waterproof capabilities, but have no reason to doubt this. They look and feel a quality product. Very pleased with these. Good fit. Good looking boots that can be worn casually as well as on the bike. A steal in the Sale! First off, these boots look great. The soft grey leather hides the fact that these are a motorcycle boot with some protection to wear areas. Let's face it, you know when you buy these you're never going to get moto-x levels of protection but it's better than just trainers. They lace up nice and snug and are very comfortable from first use. The water repellency is ok but, if I've got these on I'm wearing armoured jeans too so I ain't riding in rubbish weather anyways! Overall I'm very pleased with these and they are a lot more substantial than other brands in the same style but are still light. They maintain pedal feel fine and resist wear off the gear shift adequately. Great value for money boots. Sturdy, well fitting motorcycle boots. Look very casual. Can be used in winter. Haven't tested in rain though. Cheaper than every shop in Belgium. Very fast delivery to Belgium too. I highly recommend this shop. 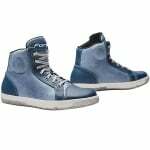 Really comfy soft boots that will be great for summer riding as well as casual wear. Very pleased. Great buy in Sale. 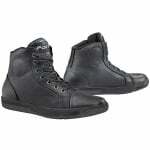 Comfy straight out box well constructed short boot plenty ankle protection. Waterproof Got these for riding my Lambretta ideal recommended. Stylish (subjective I know...) Light weight. Better than std trainers, but not what I'd call 'substantial' but you know that by looking @ them. Can be worn off bike, as I do. Bought these in a promo, not worth full ticket price, IMHO. Excellant so far, not tested the boot for being waterproof yet.The quality is high and i ordered a 44 which is one size up for me.They are quite short but this isnt an issue. You could wear them all day even off the bike as they look like a normal boot.